Garth Ennis continues his new modern horror monster masterpiece! With precious few supplies and limited ammunition, six soldiers thrown together by fate in war-torn Afghanistan have more to fear than enemy combatants or the unforgiving elements. Out here, in the middle of the desert, with nowhere to hide and rescue improbable, they are being stalked and without their knowledge, herded into a most deadly trap. But how do you fight an enemy who can take round after round of M16 fire, only to continue shambling forward, unfazed, unstoppable and undead? 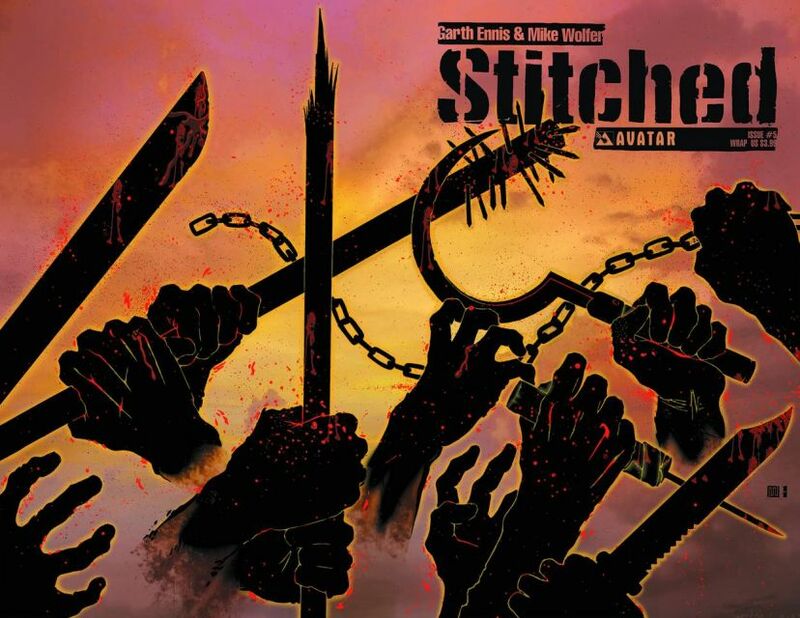 These are the Stitched, the supernatural creations of a science lost in time and before the night is through, one hero will suffer the most horrific fate imaginable. Stitched #5 is available with a Regular cover, Wraparound cover, and Gore cover by series artist Mike Wolfer, and a special Stitched Movie Photo cover retailer incentive cover.